Product #1707 | SKU 244RC | 0.0 (no ratings yet) Thanks for your rating! 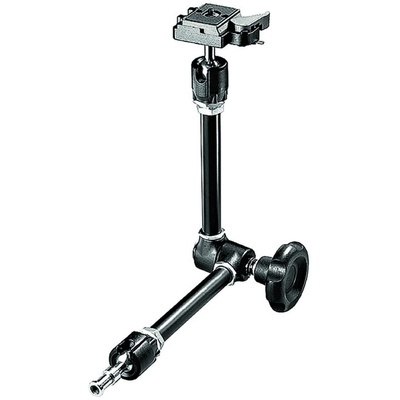 The Manfrotto Variable Friction Magic Arm is a fully articulated arm with 90° pivotable and 360° rotatable ends, and an elbow that rotates 360°. The articulated arm variable friction and locking of arm is obtained by adjusting the knob. Supplied with quick release camera plate and removable camera plate - with a 1/4"-20 thread and secondary safety lock based on the 200PL-14 camera plate mechanism. Ideal for mounting a photo or video camera exactly at the angle you need it. Fits any 5/8' female socket, works especially well with 035 Super Clamp.